This popular cider and cooking apple probably originated in Virginia but this fact remains unclear. One of the best keeping apples known and the standard by which all long keeping apples are compared. 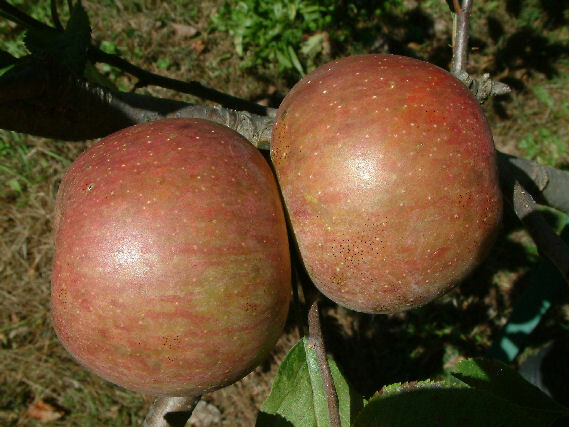 In the South this apple was more commonly known as Carthouse and was often confused with Romanite, another distinct variety. Fruit medium size, oblong to cylindrical in shape. Skin is smooth, tough, yellow with red stripes to all red. The yellowish flesh is firm, coarse and improves in flavor and texture after a couple of months in storage. Ripens in late fall and keeps well into April and May under proper storage conditions.